Gathering her figures and drawings from both the worlds she is reminded of the beautiful womenfolk of her land, the garments they wear and the unique ornaments worn by them… Bhori- the motif on a nose pin that sits and sparkles like a star on an earthy terrain of her nose, Kanjari- women’s upper garment that hangs like an art panel in front, Chopad - the four-sided game they play, the Gul & Butti (flower & creeper) arrangements that she notices around, Golaido - the bulbous little flower of Gourd (Cossignia Grandis)… all make very intricate and attractive layouts on her fabrics… With imagination at its epitome, she invents unique border designs for their minuscule level Farura (the border), on contrary to that another border design known as Molado- border inspired from the pattern on their wooden pestle, also finds place. Meanwhile, minute chain stitch adorns the outlines and starts filling within, tiny interlacing stitch starts working to fill the motifs and bits of mirror place themselves in the center of the motif, with buttonhole stitches holding them there. Pakko - is what the amalgamation of stitches is called. Other needle and thread arrangements such as Romanian, Detached chain and Back-stitch employ themselves quickly to accentuate the main stitches. In addition to the above, there is another style of embroidery known as Kachho - which is generally seen adorning the Kanjari (top garment) of the ladies above 50 years. 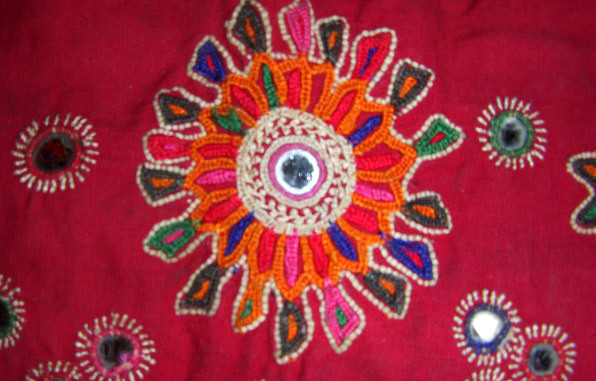 Kachho consists of single and double satin stitch, outlined with a back stitch. Mamsaigaj (the traditional name for Mushru) the most auspicious fabric for Kanjari is embroidered with cotton threads called- San. The stitch consists of single and double satin stitches, outlined with back stitches. These motifs and threads seem to grow as she grows; taking shapes witnessing various phases of her life as she embroiders and wears them. Like a fully blossomed tree in young age, she wears densely embroidered upper garments with vibrant thread work, with the glitter of the mirror (Tak) on them. 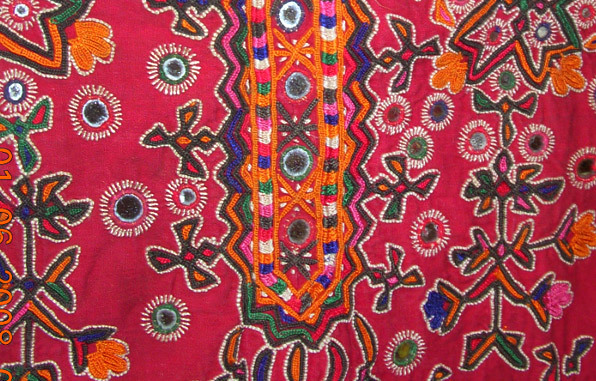 Embroidered attires, as well as accessories, are exchanged during cultural rituals such as weddings. Contrasting color variations attained through an intuitively selected bright pallet… a composition of creative motifs and shiny hues on a solid colored background that fills exuberance in life… These arrangements seem to coincide with facts of her living condition in parched lands. Her embroidery sets a contrast to the overall impact of the locale… the contrast that she desires to bring into her life, her society… In such magical ways, the characteristics of the embroidery are defined… the Mutwa embroidery… the embroidery of a girl who travels far in her imagination while social confines keep her within limits. In line with the tree’s life, as she matures, she gradually loses interest in wearing extensively decorated clothes… the quantum of her embroidery seems to be mellowing to a more subtle form. However, a little ornamentation on her apparel constantly stays as an indication of times in her life when she was carelessly upfront. Mutwa often lead a life synchronized with the rules of their immediate nature. 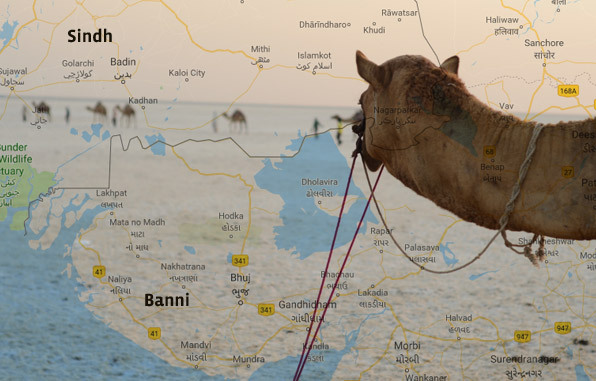 Settled in the western part of Indian subcontinent, in the desert of Kutch, these people of Banni are said to have migrated from the land of Sindh. More than 17 sub-communities in the cluster practice vivid needlework with Mutwa, leading them all with their vast imagination and intricacy of work. Apart from their main livelihood as cattle herders, the women constantly get back to their only creative expression in leisure time. 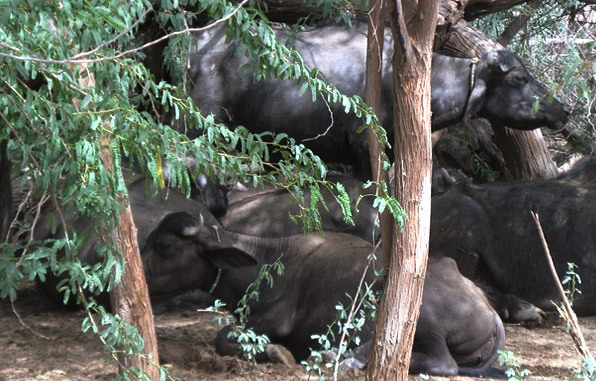 Their need to decorate clothes is by heart lined with the behavior of their environment. Mutwa embroidery is also misunderstood as Aari work. The craft and its practitioners are affected in recent times due to increase in footfall in the cluster. 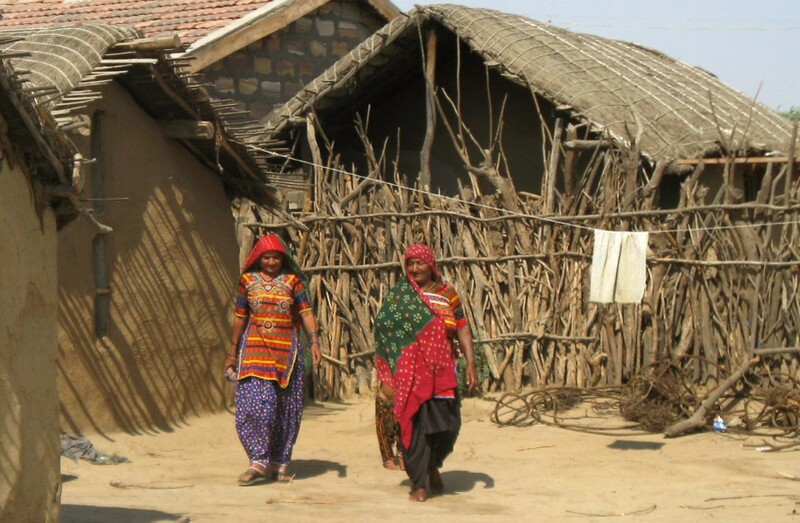 As degradation in soil composition affects the growth of trees, similarly change in basic garment silhouettes because of increasing interest of tourists in visiting the village has forced the community to bring changes in their dressing style, which has further affected their embroidery layouts. These pieces of self-expression, only to be kept and passed on through generations as souvenirs are now beginning to fall into the hands of buyers and are also now made to order. The quality of work is decided in accordance with the payment offered by the client. 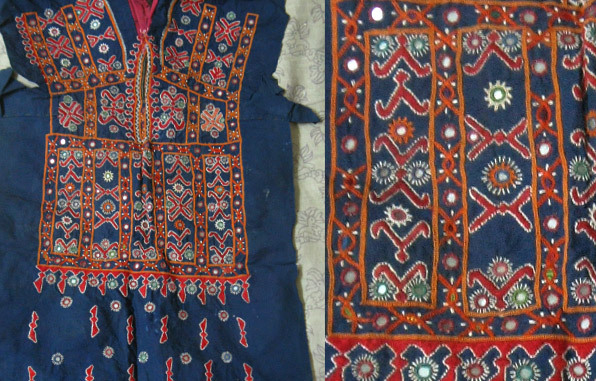 To take the example, Pakatadi- buttonhole stitch or scattered Romanian stitch embroidered around mirror has two versions- Regular and Sarkari, the latter being of less density. 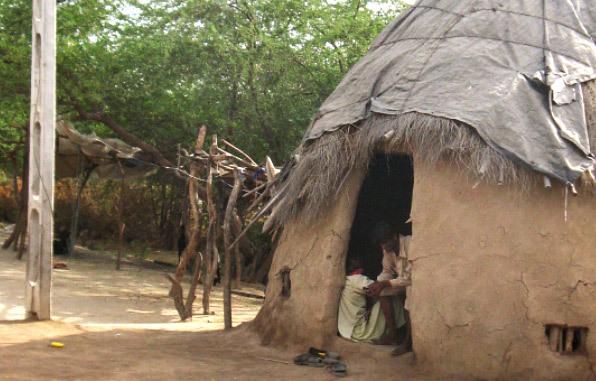 It is said that amongst all embroidery practicing communities they receive the highest payments for their work. A real introspection of a culture dabbled with art from heart. Awesome narration information even better. This post is genuinely a pleasant one it assists new web people, who are wishing for blogging.